Dr. Charlyn Quiec, or “Dr. Q,” provides a variety of effective dental procedures to patients in Sierra Madre. Porcelain veneers are a common treatment she uses to help patients improve the appearance of their teeth and smile. Veneers are thin layers of tooth-like material. Dr. Q uses these layers to resurface the visible portion of teeth. Veneers are typically made of porcelain or composite materials; however. Dr. Q recommends porcelain because it tends to be more durable. If you are interested in cosmetic options for your teeth, learn more below about Dr. Q’s work in Sierra Madre, porcelain veneers, and what you can expect from your treatment. Sierra Madre patients begin with a visit to Dr. Q’s office. She’ll discuss your dental concerns so that she can identify what types of treatment options make sense for your goals. Next, Dr. Q will conduct an examination to learn whether you are a candidate for veneers or for another cosmetic dental procedure; people with more significant tooth damage may require crowns rather than veneers, as crowns provide a durable surface for the entire tooth (and not just the visible surface). Either in the same appointment or in a second visit, Dr. Q will prepare your teeth for the veneers. She removes a small amount of enamel from these teeth, creating space for the veneers to fit. While the process is not particularly painful, Dr. Q may provide local anesthetic to ensure your comfort. Porcelain veneers are customized to each Sierra Madre patients’ mouth, so Dr. Q will send the design specifications to a dental laboratory that specializes in their production. She only works with U.S.-based labs to make certain of the quality of these materials. Once your veneers are ready—typically a week or two later—you will return to Dr. Q’s office for bonding. Dr. Q will make sure that the veneers fit properly in your mouth. Then, she will clean, polish, and etch the surface of your teeth to ensure a strong connection with the veneers. A powerful bonding agent is applied to the veneers, which Dr. Q will place, clean, and examine. By the end of your appointment, you have a completely new smile. If you want to reduce gaps between your teeth, porcelain veneers can decrease this space and provide greater symmetry. An attractive porcelain veneer can front broken or crooked teeth. Veneers can serve in place of teeth that are discolored and unresponsive to whitening. In addition to greater durability, porcelain veneers are less prone to staining than composite veneers. They also have more natural light-reflecting properties; as a result, they appear more like your existing teeth. The first step in determining if porcelain veneers are right for your needs is to schedule an appointment with Dr. Q Dental. Our practice provides you with the information you need and guide you through the entire process. 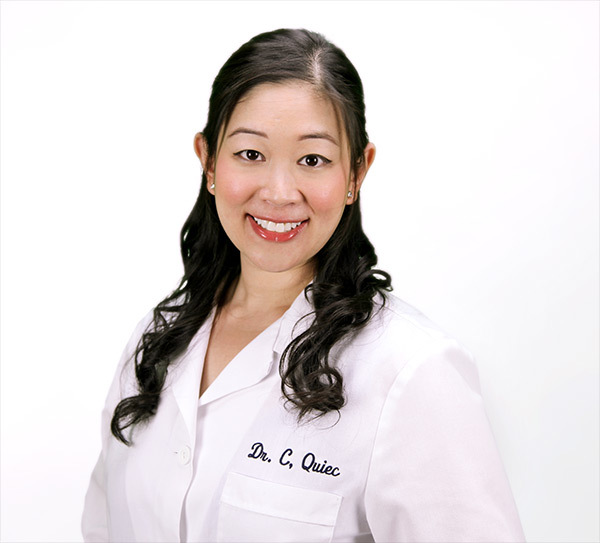 Contact Dr. Q today for an appointment at her office in the Sierra Madre area. Call 626-599-9818.